In the early 2000s, OutKast seemed poised for world-conquering superstardom. But flush with the success of 1998's Aquemini and 2000's Stankonia (and hit singles like "Rosa Parks" and "Ms. Jackson"), the Atlanta hip-hop duo of André 3000 and Big Boi fractured instead. When the double-solo-album package Speakerboxxx/The Love Below hit stores in 2003, the two halves couldn't have sounded more different: Big Boi's Speakerboxxx was a continuation of the group's beloved Dirty South funk and rap, while Dré's The Love Below dabbled in everything else, flirting with soul, pop, R&B, and Prince-like ballads. A great group was clearly going its separate ways. Since then, aside from the mostly forgotten 2006 movie Idlewild, OutKast have mostly spent their time not being OutKast. Big Boi has stayed busy as a solo artist, while André 3000 (aka André Benjamin) focused on an acting career (Be Cool, Four Brothers, Semi-Pro) that never quite caught fire. The more reclusive of the pair, Benjamin will still drop the occasional guest verse, each new one received in the hop-hop community with the same hushed excitement that a new Terrence Malick film inspires in cinephiles. But until this year's festival-hopping reunion tour, Benjamin had shot down any notion of new OutKast activity. And even now, he still sounds ambivalent. "When you get out onstage and you're doing these songs that you wrote when you were 17, it's not the same," he told Rolling Stone recently. "When I wrote those songs, it was fresh. I meant it at the time. Now, it's just words that you're spewing." Turning 40 next year, he talks about doing a solo album but admits to being "at a stuck place" with it. One of rap's finest vocalists and trippiest individuals, Benjamin has spent the last decade mostly in the shadows, a frustration to fans of his particular blend of searching, playfully profound wordplay. Our wait is over, although his newest creative expression isn't through an album. 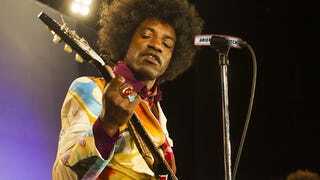 Instead, he's the magnetic center of the challenging and intelligent new Jimi Hendrix biopic Jimi: All Is by My Side. Writer-director John Ridley (who won an Oscar for his 12 Years a Slave script) didn't have access to Hendrix's music for his story of the year leading up to the musician's breakthrough 1967 performance at the Monterey Pop Festival, but it's remarkable how little you'll miss it. No mere boilerplate biopic, the film is instead an immersive, impressionistic snapshot of a small period in Hendrix's life when he was living in London and trying to decide what kind of artist he was going to be. This inquisitive approach has angered those who knew Hendrix—specifically girlfriend Kathy Etchingham, who has vocally refuted Ridley's portrayal of her relationship with the guitarist as being violent. But having seen the movie twice now, I'm struck by the fact that Jimi is less "about" Hendrix than it is about the filmmakers' reaction to the difficulties inherent in fame and creativity. And in a lot of ways, it also feels like Benjamin's delayed response to his fans' concerns about him these past few years. Benjamin once described the plot of Idlewild this way: "It's about this entertainer who at the top of his career just totally, completely stops doing it." He lived out that fantasy in his own life: He didn't completely stop, but he definitely dialed down his recorded productivity after The Love Below. Watching Jimi, I thought a lot about his complaints that OutKast songs no longer felt fresh. Some critics have complained that Benjamin is more than 10 years older than Hendrix was during the events the film depicts, but that actually seems weirdly appropriate here. He does a great job capturing Hendrix's mumbling, mystic-in-training patter—the way his words flowed together like they're songs without music—but what comes across most strongly is the character's indifference to the trappings of rock 'n' roll. It's as if the older man is commenting on the younger man's situation, allowing Benjamin a chance to relive a bygone period in his own life. Utilizing jump cuts, dissociative editing, and a generally blasé attitude toward the celebrities Hendrix meets—huh, there's Eric Clapton, whatever—Ridley wants to demystify stardom to focus on the flesh-and-blood realities of people stumbling toward a career in the arts. The Hendrix on display in Jimi is an incredibly gifted guitarist and certainly wants to have hit singles, but he's not sure if all the fuss is worth it. In the film, we spend zero time watching songs get created, instead observing as Hendrix encounters several different beautiful women who serve as muses: Linda Keith (Imogen Poots), Keith Richards' girlfriend who takes a shine to Hendrix in New York when he's still just a guitarist-for-hire; Kathy Etchingham (Hayley Atwell), a London scenester who begins a serious relationship with him; and Ida (Ruth Negga), a fictionalized character who tries to get Hendrix in touch with his African roots. There are parallels with Benjamin here, too: He's always been willing to talk openly about his love life in song, from "Ms. Jackson" on down. Most music biopics can't wait to get their main characters to the point when they're discovered, setting the stage for the predictable, triumphant look-how-successful-they-are montage (immediately followed by the inevitable drugs-have-really-taken-their-toll montage). Jimi doesn't bother with any of that and, more radically, suggests that Hendrix was a perfectly interesting, happy guy before he became famous. Benjamin plays Hendrix as a regular person: uncertain about love, feuding with a distant father, awestruck by the new Dylan album. When someone in Jimi refers to Hendrix as a genius, you're almost caught off guard. Now we think of him that way, but the movie doesn't oversell that point. In Jimi, he's just some occasionally temperamental, kinda sweet kid who's really good with a guitar. Often, when actors play musicians, the trick is getting them to seem convincing when it comes to actually playing music. But Jimi is that rare biopic where the offstage and out-of-the-studio moments are far more important. Benjamin's never had a character this complex to play, and he carries it off with style. Working the guitar and inhabiting the world of a top-flight musician is no problem for him, but it's his stillness that's really arresting. Benjamin conveys Hendrix's genius not through wild flourishes, but with quiet confidence. No wonder so many men and women are drawn to the guy: His understated presence is galvanic, making you wonder what he's thinking behind the sleepy eyes, loopy smile, and crazy hair. That confidence is an act in real life, too. "That it's easy for me, I guess, is the biggest misconception," he told GQ in 2012. "People think you kind of ride on this wave, this non-human wave, and I think that's kind of wrong to put that on entertainers ... It's hard work just like anything else." In that same interview, he noted, "It's funny, I don't even consider myself a rapper, I don't consider myself a designer, or even an actor ... I just like creating stuff and trying to make good work, whatever it is. I don't care if it's designing toothbrushes. It's just making cool stuff to leave behind, that's all it is, it's nothing more." With his funky outfits and out-there videos, Dré has always seemed a bit like a benign alien, this cosmic weirdo who's a little off but incredibly talented. His reticence about the spotlight has only intensified our fascination, and perhaps that's what accounts for his ambivalence. With that in mind, Jimi provides him with the best of both worlds. He's not playing himself, but through the withdrawn, mysterious, undecided Hendrix, he gets to express some of the misgivings he has about the entertainment-industry machinery without revealing too much. And he does it with impeccable artistry. As Jimi ends, the guitarist walks off into the distance, prepared to become the legend we all know. It's a bittersweet moment, because it also signals the end of the pre-notoriety Hendrix, the life before the crushing demands of fame. Benjamin has said that he doesn't like nostalgia. But one wonders if he doesn't deeply identify with this younger Hendrix, envying the seemingly endless possibilities that life presents when the songs are still fresh.